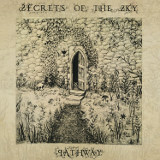 Secrets of the Sky's sophomore effort, Pathway, reveals some truly excellent tracks amidst what is at other times a bit of a mixed bag. Due to an overly uneasy combination of doom, black metal, and dark ambient, as well as the need to adhere to a concept-album format, it seems like the band occasionally doesn't know what they want to do. But when the band gets it right, they really nail it, and the good parts on this one make up for the so-so parts. There are thirteen tracks, but what that really amounts to is six in total; the rest are ambient passages designed to establish atmosphere, an atmosphere consisting of lots of washing waves and walking footsteps. The vocals and background music on Three Swords start soft and ethereal, but veer abruptly into black metal vocals layered over something that sounds a lot like the guitar work on a Katatonia album. And that's pretty much all the listener gets of black metal; other than the occasional vocal passages, this is a depressive doom album through-and-through. Angel in Vines has big, solemn, echoing guitar riffs with a backing keyboard choir, like a less-retro Pallbearer, and though vocalist/keyboardist Garett Gazay's growled vocals are quite good, his clean ones are better; thin, nasal, and sighed most of the time, they're a perfect fit for the funereal sound. Another Light is less impressive than the first two, being short, rather tuneless, and without the metal, but Garden of Prayers's windingly picked clean guitar, plinking against a background of guttural riffing, more than makes up for it, and even all the wordless vocalizing Gazay's doing on the track, always a risky proposition on a metal album, sounds good here. Inexplicably, they switch moods completely with Fosforos. Maybe the band felt like things were getting too slow and quiet? It's loud and fast, almost thrashy, with shrieked vocals and heavily distorted guitars that stick around till the end, when it switches to more quiet picking, and I didn't think too much of it; the switch is too jarring and kind of spoils the mood. Eternal Wolves, the final track, is far superior. It has plenty of aggressive singing on it too and even a bit of tremolo-picking, but sounds much more in line with the rest of the album's sound. To end the whole thing, the final ambient track ends with a very distinct, almost cartoonish sound of a sword being drawn from a sheath and either cutting off someone's head or stabbing. I'd like to say that this tells a story of its own, but it really doesn't; the ambient tracks are another vestigial organ of the album that could have been tossed without any listener shedding a single tear. Despite my not being a fan of a couple of the tunes or of the ambient portions, the majority of the full-length tracks make this an album completely worth getting. The doom/black metal hybrid portions are especially good, and any fan of emotional doom like Pallbearer or Warning is probably going to enjoy this.